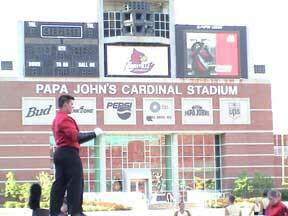 Americanos' drum major in Louisville tonight. Americanos, a Division III corps from Menasha, Wis, performed second this evening. Perhaps foreshadowing strong Division III competition this summer, Patrick Mac Nick, 16, a two-year contra vet from Ferndale, Mich., said, is anticipating a great showing from his corps this season. "We're taking first!" Mac Nick said. Mac Nick said the corps is attempting to boost its enrollment in future years. "We're hoping to grow, little by little, every year," Mac Nick said.